Could a better annual leave policy bring you more talent? When a candidate comes to interview at your company, there’s a standard set of questions they want answered. What is the salary? Will there be opportunities for progression? Do you offer private healthcare? What is the pension scheme like? Now, another query is increasingly being put on the table. More and more potential employees want to know their holiday entitlement before signing on the dotted line. Non-salary benefits are having a bigger influence on recruitment than ever before, with recent research by Hays finding that 6 in 10 people look for more than 28 days of annual leave as part of their ‘perks’ package. Offering this much paid holiday may seem daunting to company bosses at first glance. However, enhancing the volume of annual leave available to employees could make your business stand out from the crowd – and help to attract the best talent in your field. The challenge your firm faces is managing this leave seamlessly, in order for the reality to live up to the promise. While there is clearly an appetite for more annual leave among the workforce, there is a gap between employee expectations and employer provisions. The same Hays survey that identified the desire for 28 days off a year found that only a third of businesses offer this much paid holiday. Many organisations worry about the impact that increasing paid leave entitlements will have on your business. More holiday equals more staff cover, either bringing temporary contractors on board or asking other team members to pick up the slack. It’s also a cost drain, as permanent staff will still receive their full salary despite being in the office fewer days each year. Another concern that many companies have is the logistical side of managing more staff leave. Many rely on spreadsheets, word documents and whiteboards to track who is off at any point in time. Adding extra dates could push these manual systems past their natural limits. Looking past these initial fears reveals a number of benefits available to open-minded organisations. For starters, the fact that few businesses offer 28+ days leave makes it a real competitive differentiator. In the race to attract raw talent, perks of the job can be the deal clincher when a strong candidate has applied for two similar roles. In addition, increasing the amount of paid holiday offered to staff sends out a clear message that you care about their wellbeing, and want to form long-lasting employee relationships. Valued workers have more chances to recharge their batteries, and if they are unlikely to get the same holiday allocation elsewhere then it is an incentive to stay with your company. Finally, if your company is renowned for offering a good holiday package, chances are that news of this benefit will spread. This will support your ongoing recruitment initiatives, as satisfied employees recommend your organisation through word of mouth. To truly be a candidate selling point, however, promises of more paid leave need to live up to the hype. There’s no point adding extra days to staff entitlement if the holiday calendar is so badly managed that they can’t use their additional allocation. 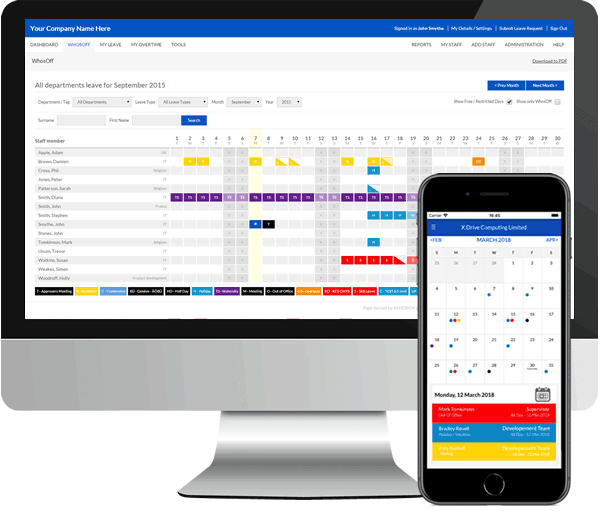 The challenge of co-ordinating calendar complexities is the reason that many businesses choose to bring staff leave management software on board. Spreadsheets and whiteboards are replaced by a digital system, which gives everyone access to the complete company holiday record through their own personal log-in. Admin restrictions can be set so that only certain staff can update the software, but all future holiday requests can be channelled through the solution to make staff leave management much quicker, clearer and more visible across your company. A strong annual leave entitlement can be a deal closer when talented candidates come to interview. However, a premium perk can soon turn sour if it is not handled smoothly when new personnel start at your workplace. Investing in an online leave management solution is the quickest, most cost-effective way to simplify the tracking and approval of staff movements throughout the year. By centralising all requests, everyone in your organisation has access to a year-ahead view of annual leave – and can easily plan their own days off based on who is going to be in the office at each point in time. Try WhosOff leave management software for free to see how your business can streamline staff holiday requests. Title: Could a better annual leave policy bring you more talent? How does a fast-paced digital marketing agency ensure that staff holiday doesn’t slow down project delivery times? Finding the right person for the job is an ongoing challenge for business owners, so when the right person comes along, the idea of them taking leave can sit uncomfortably. However, we all know employees can’t be on call 24/7,365 days a year. We’ve all faced the headache of trying to squeeze in a trip to the doctor or dentist around work. Not every appointment can wait until an evening or weekend, yet it somehow doesn’t feel justified taking time out of the office.